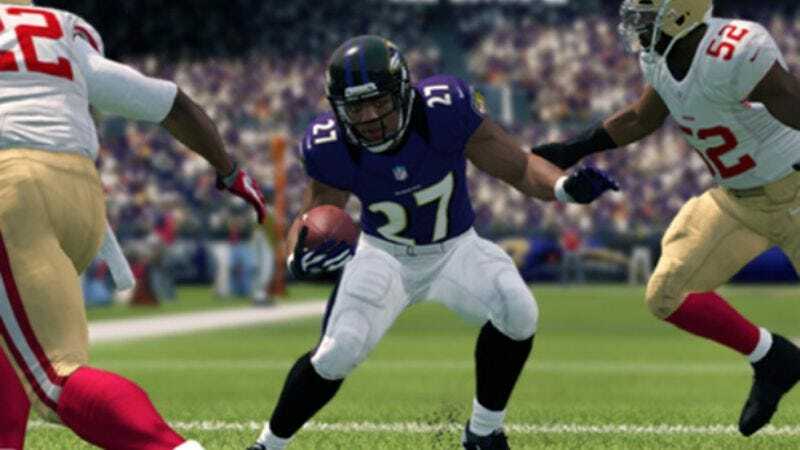 Electronic Arts will be removing former Baltimore Ravens running back Ray Rice from its popular new Madden NFL 15 game. EA joins a long line of companies—including Nike, VertiMax, and many sporting goods stores—cutting ties with the player after he was indefinitely suspended from the NFL for domestic abuse. Rice will be removed from the game’s roster through an online update on Friday. Public outcry over Rice’s minimal sentencing was so vocal that in August, NFL Commissioner Roger Goodell issued an apology for his handling of the case and promised harsher sentencing in the future. The NFL’s new policy now requires a six-game suspension for the first offense and a one-year suspension for a second offense, with reinstatement to the league not guaranteed. The Rice case was brought back into the spotlight on September 9 when TMZ released the disturbing video that actually showed Rice punching Palmer, knocking her to the floor before dragging her from the elevator. The NFL—which claimed not to have seen that portion of the video before—immediately terminated Rice’s contract with the Baltimore Ravens and suspended him indefinitely from the NFL. For their part, both Rice and Palmer maintain the attack was a one-time event. Palmer has since taken to Instagram to defend her husband. The incident has stirred a national conversation about domestic abuse. The Twitter hashtags #WhyIStayed and #WhyILeft have attempted to refute accusations that women are responsible for not leaving abusive relationships at the first sign of trouble (many people, including Fox News, have criticized Palmer for marrying Rice after the incident). President Obama weighed in on the situation through a statement that read, “Hitting a woman is not something a real man does.” Activists are calling for the NFL to instate harsher domestic abuse punishments and to offer counseling and training on the issue, as Rice is far from the only player involved with domestic abuse.